With great weather year-round and plenty do both outdoors and indoors, Phoenix is a wonderful place to spend a long weekend. 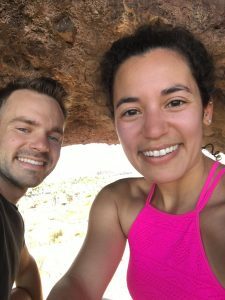 We spent four days visiting Phoenix and loved our time there. However, we feel like we barely scratched the surface of everything it has to offer. Before diving right into our Phoenix recommendations, we recommend that you have a car when visiting Phoenix. It’s nearly essential to have or rent one because the city is so spread out. You could take public transit or Uber/Lyft everywhere, but that would be time-consuming or costly. In stating that, we had a car in Phoenix because friends of ours drove from San Diego to meet us there. Phoenix is very spread out, as previously stated. 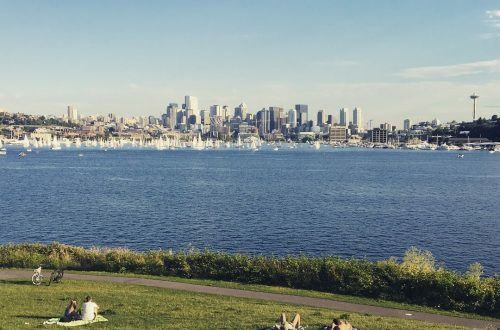 There is a downtown with things to do, but it’s different than most downtown areas in the United States. As you probably know by now, we almost always stay in Airbnbs. Our Airbnb was in Scottsdale, a city just east of Phoenix. We chose to stay in Scottsdale due to a few friends’ recommendations, and like previously stated, we had a car to get to different parts of the city. 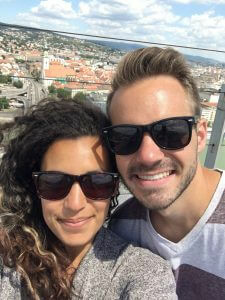 We really liked the Airbnb, especially because we were sharing it with another couple, but it was a little far from stuff if we didn’t have a car. It was also a bonus that it had a pool! 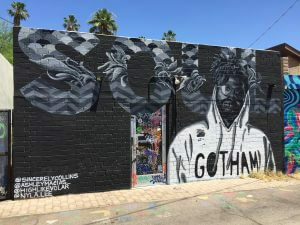 Since Phoenix is spread out and we visited some other places in the greater Phoenix area, we have it broken down here in areas that we explored. The first day we were in Phoenix, we spent nearly a full day in Tempe exploring the area around Arizona State University. This was a short, but steep, hike. There were great views of all of Tempe, Arizona State University, and Tempe Town Lake. Since it’s Arizona and it can be super hot, go early in the morning or at dusk and BRING WATER. The ASU Art Museum is a gallery for their Ceramics Research Center. It’s free to enter, but you can leave a donation if you want. While we initially used it as a quick escape from the heat, the museum was really cool and had a lot of different artwork, some of which was available for purchase. ASU is one of the top ceramics schools in the United States. We just walked around the park, but you can rent a paddle boat, paddle board, or boat. 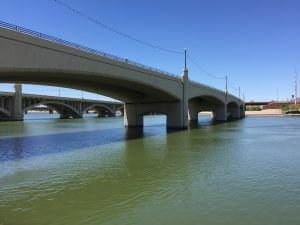 Tempe Town Lake is a manmade lake in the Salt River and is a nice bit of water in a very dry landscape. 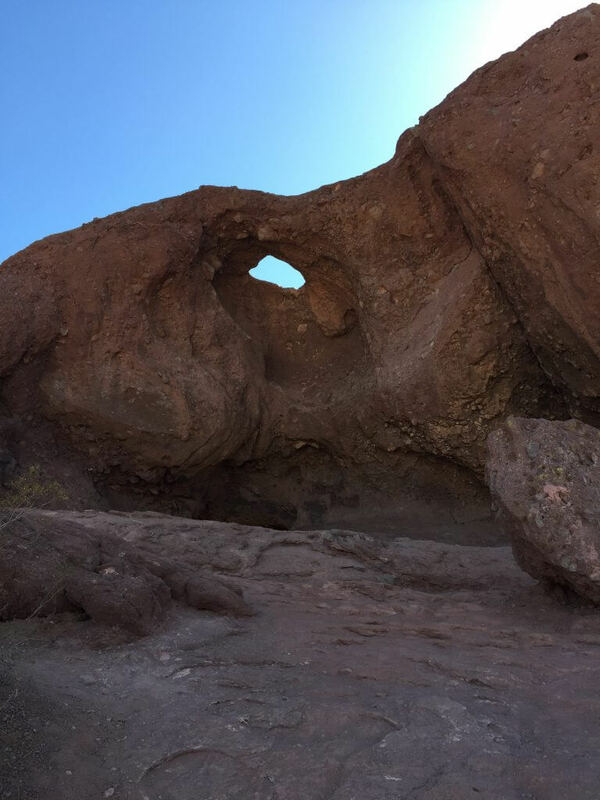 Papago Park is best known for the Hole in the Rock. There’s a large rock formation with a hole in it where you can sit and look out over Phoenix. We walked there from Tempe, but you can park right in front of it and hike up about 5-10 minutes. 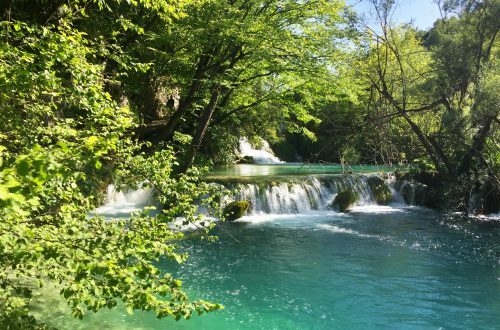 It’s not strenuous at all and is a quick, fun, little hike. The hike from Tempe isn’t something we’d recommend, especially after a few beers in 100°F heat. . . but hey, we made it! Although where you pick up your tube and get in the river technically aren’t in Phoenix, we decided to list it here because it’s still a Phoenix activity. If you have never been tubing down a river, we highly suggest doing it. You rent your own tube and cooler (or bring your own), tie it to your friends tubes, and coast for the next 5 hours. Make sure you pack snacks and drinks – water too! Don’t litter! Whatever you bring into the river, bring out! We will say, a few parts were a little scary. There was one point where the river got a little fast, but it only lasted for about 30 seconds. We also saw TWO snakes in the river!!!! We just walked around the Phoenix Arts District, named Roosevelt Row Arts District. 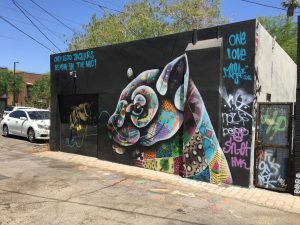 It’s spread out, like most of Phoenix, but there are plenty of fantastic murals and unique art galleries. There are also a fair share of cafes, restaurants, and bars. 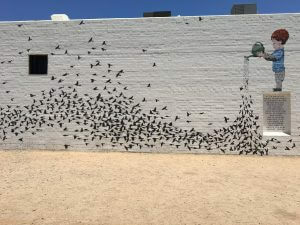 It’s a cool area near downtown Phoenix that’s worth checking out. 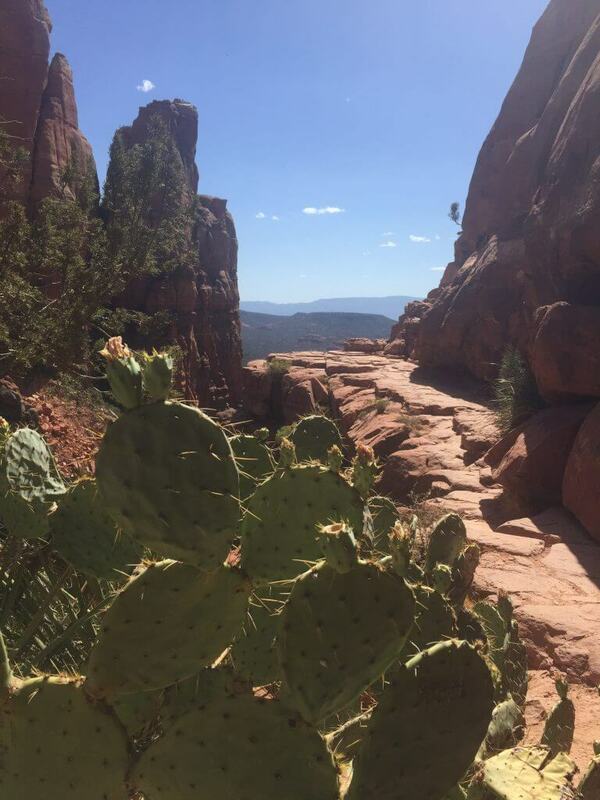 We took a day-trip to Sedona from Phoenix – another advantage to having a car. It was about a 2-2.5 hour drive with traffic. 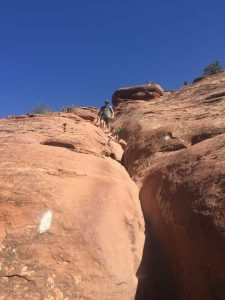 In Sedona, we did a couple shorter but beautiful hikes. We took the longest possible path on this hike, so it was about 6 miles round-trip. Aside from the distance and heat, the hike wasn’t strenuous. It was relatively flat except for the final steep climb up to Devil’s Bridge. Once you get up to the top, you can see the trail’s namesake: the Devil’s Bridge. There was quite the line of people waiting to get a photo out on the bridge. We waited for a little and then opted to skip the photo out on the bridge. People estimated we would have had to wait about 45 minutes to get out there if there weren’t any proposals. Devil’s Bridge behind the line to get out to it. . . This hike was much more strenuous than the Devil’s Bridge, but it was a shorter distance overall. The views were AWESOME, and it was well worth the rather strenuous climb up in the heat. When you get to the top you can check out some other “trails” that lead you around the rock formation. This is a view at the hike up Cathedral Rock. We walked around the Scottsdale Quarters which is a big, fancy mall with things for the whole family to do. There are plenty of good restaurants here too. Another night, we walked around Old Town Scottsdale. There were tons of cute boutiques and shops. Supposedly Old Town Scottsdale has great nightlife, but we didn’t get to check it out too much. From everything we’ve heard though, it’s somewhere we’d like to go back to! 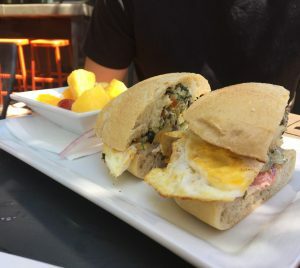 Ncounter – Ncoutner is a quick, but delicious, order-at-the-counter brunch place in Tempe. The food was pretty good and affordable, and the menu was fairly extensive. 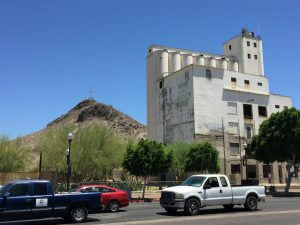 It’s also located right on Mill Ave., in the heart of Tempe. 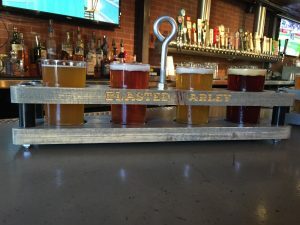 Blasted Barley Beer Company – For an escape from the heat, we ducked into the A/C at Blasted Barely Beer Company and ordered flights of beer. They had a large selection of beer and a cool atmosphere with lots of indoor and outdoor space and tons of TVs and games. 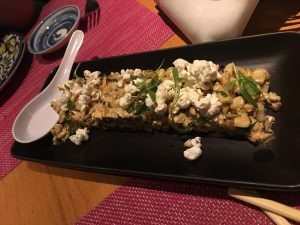 Sumomaya – This was probably the number one restaurant in Phoenix/Scottsdale that we ate at. 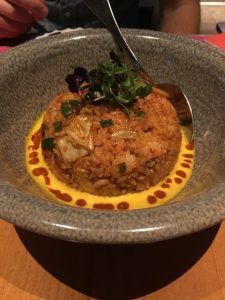 It was Mexican-Asian fusion. While being absolutely delicious, it was quite pricey. Make sure to call ahead too because there can be a long wait as it’s a very popular place to eat. D’Lite – D’Lite is a healthy to-go restaurant that has vegan and vegetarian options, plus a drive-thru. There are a ton of yummy healthy options including sandwiches, shakes, and salads. We actually went there twice because it was healthy, tasty, and fast. 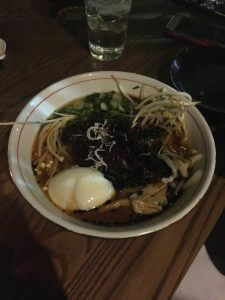 Obon – Obon had some pretty good ramen, sushi, and sticky buns. The food was good for the price, but it was a little on the pricier side. Coach House – The Coach House is a dive bar with cheap drinks. It’s also apparently the oldest tavern in Scottsdale, having been established in 1959. It’s a great place to pre-game and almost looks like someone’s house with a huge front deck. Patties Bar – Located in Old Town Scottsdale, this is another fun, divey bar with dollar bills tacked up all over the walls. The drinks were cheap here too. 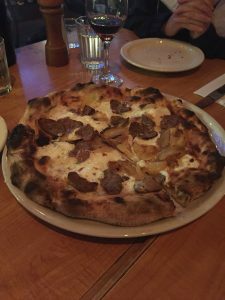 Pizzeria Bianco – Pizzeria Bianco has been named the Best Pizza in America. Plenty of people rave about how good the pizza is, like here and here and here. We really liked the pizza, but we don’t know if we’d call it the Best Pizza in America. However, it was really delicious pizza and a place we’d recommend checking out in Phoenix. There are a few different locations in the greater Phoenix area. 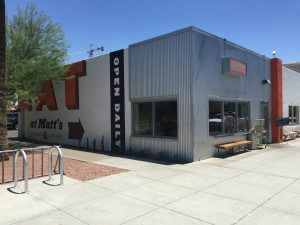 Matt’s Big Breakfast – Matt’s Big Breakfast is in the downtown Phoenix/Roosevelt Row Arts District and serves reasonably priced, high-quality food. All their ingredients are locally sourced and fresh. We opted for the chilaquiles, and they were exquisite. There are a few different locations in the greater Phoenix area. Cornish Pasty Co – Post-valley bar, we stopped in for some bar-time food at Cornish Pasty Co, and it was delicious! It’s not just drunk food though, as we’re sure it’d be just as good during the day. There are a few different locations in the greater Phoenix area. 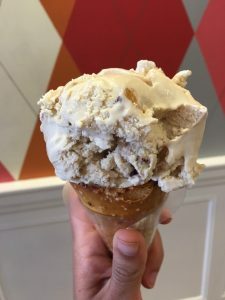 Churn Ice Cream – The ice cream at Churn was pretty good. They are known for having a pretzel cone but the pretzel cone. We gave it a try and would probably get a waffle cone next time around. Valley Bar – Valley was a hidden bar tucked away in an alleyway in downtown Phoenix. There was a bouncer at a rather plain door with stairs leading to a basement. Once downstairs, the atmosphere was awesome. They also served strong, inexpensive Old Fashioned drinks. If you’re going out in downtown Phoenix, check this place out! 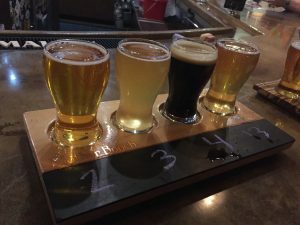 Mother Bunch Brewery – For some post-pizza drinks, we got beer flights at Mother Bunch Brewery in Phoenix. The beer was good, and while we didn’t have any the food looked good too. We even met some other people from Wisconsin here! Lose Leaf Bar – The Lose Leaf Bar was in a renovated house in the Roosevelt Row Arts District. There were a number of bars like this in the neighborhood. This one had live band playing, and actually has free live music every day of the year. What recommendations do you have for people visiting Phoenix?